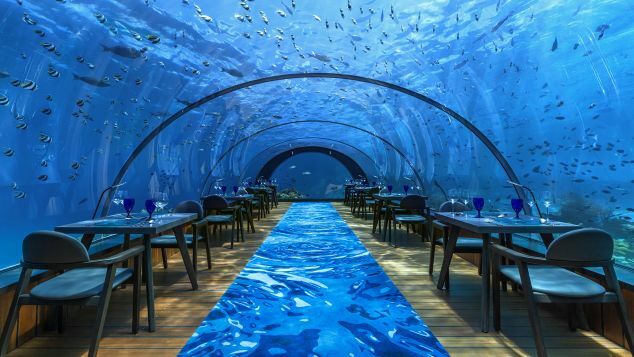 (CNN) — A warning to travelers heading below sea level to dine at luxury Maldives resort Hurawalhi's 5.8 Undersea Restaurant. Your manners will likely be left up on the surface -- along with your shoes. Cutting off one's companion mid-sentence is almost a certainty as you rush to point out one of the remarkable sea creatures swimming by, whether it's a reef shark or -- if you're lucky -- an octopus. 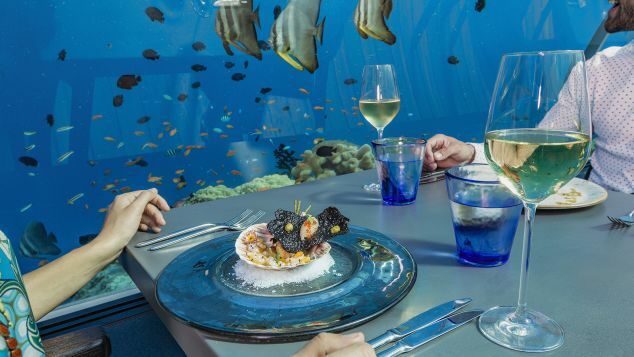 Opened in late 2016, 5.8 Undersea Restaurant is the world's largest all-glass underwater restaurant. Its name comes from the depth at which the restaurant sits -- 5.8 meters (about 19 feet) below the surface. To access the restaurant, diners walk across a pier towards the resort's over-water Aquarium Restaurant and head down a separate path to a long, winding staircase. Each of 5.8's 10 tables offers views of the outside action. The coral landscape, which stretches around the edges of the tubular structure, draws all shapes and sizes of sea life right up to the glass, leaving you with the inescapable feeling that you're the one on display and the sea life are actually looking in at you. It's tempting to feel sorry for the chef tasked with creating a menu that competes with these views. But during a recent visit by CNN Travel, German chef Bjoern van den Oever's dishes had us not just excited for what was swimming by the glass, but what would next appear on our plates during the seven-course dinner. "it's a lot of pressure," admits van den Oever, who works with a team of six chefs. "You have to keep up with the surroundings, you don't want people getting bored by the food. So we have to always keep the food exciting as well." As a result, he says lot of people have underestimated the restaurant and come in with low expectations -- only to be blown away. "We wanted to create something special," he says. "More like where people can sit and have a whole theater of things going on. Not only the fish outside, but also on the plate. So everything was very inspired by the surroundings: the coral life, the fish. And there's a lot of small details where you can look on the coral and you get the reflection on your plate." Courses include a mix of unique meat and seafood-based dishes that emphasize the flavors of the local and imported ingredients. For example, there's the "Diver Scallops," served with apricot and almond vinaigrette. "We take one product and we try to make the best out of it," says the chef. "So you have scallop in two ways: You have the seared scallop and then the scallop tartare. Which shows, basically, both the raw and the cooked scallop so we have a better experience eating the dish." All courses -- sent down via a tiny elevator near the kitchen above -- are paired with a selection of top wines, selected by the resort's sommelier. In addition to the seven-course dinner menu there's a four- or seven-course lunch. Diners from other resorts are welcome to visit -- provided they don't have kids in tow. 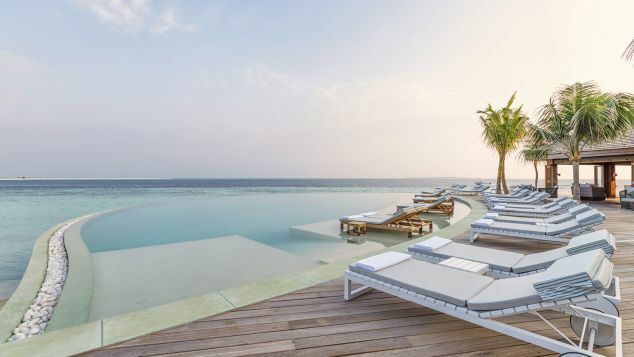 Hurawalhi is an adults-only resort. "I became a chef because I wanted to make people happy," he says. "And with a restaurant like this, it's very easy." "Basically what I did is [find] dislodged coral blocks, which were not healthy," she says. "Then, I transported them to the restaurant in hopes that it would start to regain these coral animals that live inside." 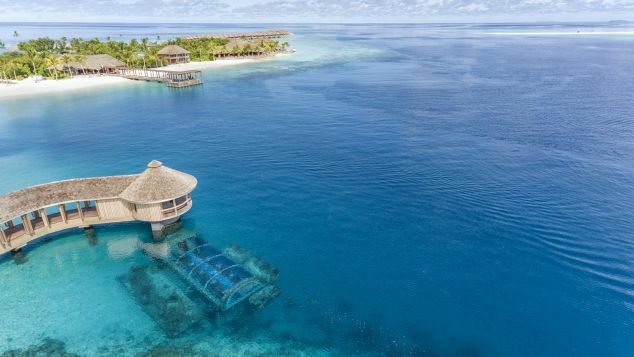 "Once I saw that it was going to work then we started to take bigger blocks and create a natural reef landscape, something that would attract fish in a way that is representative of the Maldives. "It's an actual living, thriving reef system and ecosystem, which will grow on its own." Though the sheer breadth of sea life drawn to 5.8's corals is to be expected given the diversity of the Maldives' marine ecosystems, Bennett admits they were surprised by just how many species decided to move in. "That's what makes it so rewarding now," she says. But long before any coral was built came the most difficult task of all -- actually building the restaurant. 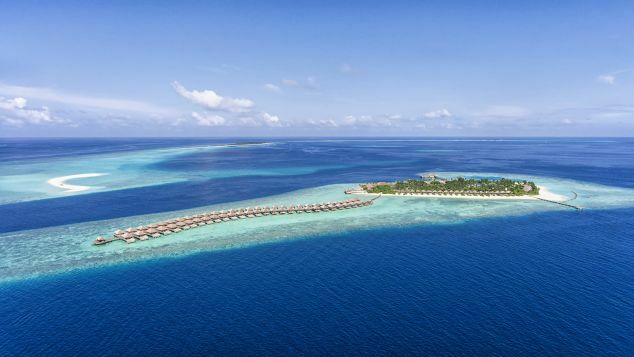 Located in the Maldives' Lhaviyani Atoll, this five-star luxury resort was designed by Japanese architect Yuji Yamazaki, of YYA New York, and is owned by Crown & Champa Resorts. 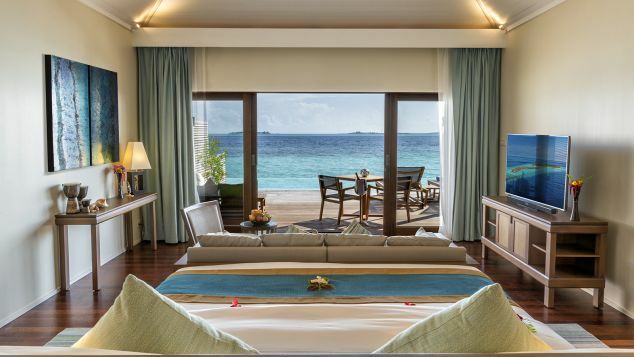 Just a 40-minute seaplane flight from Male International Airport, it's made up of 90 spacious, contemporary villas. 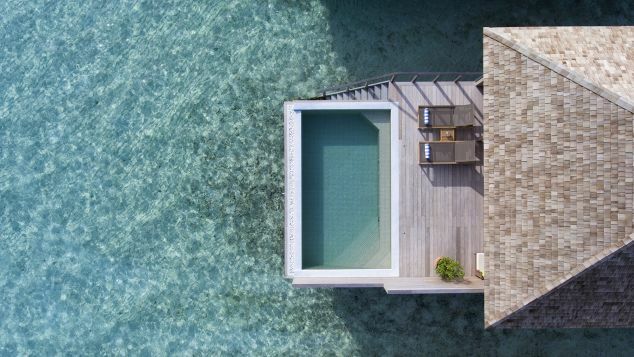 Sixty are over-the-water villas and 30 are on the beach. Some come with infinity pools. 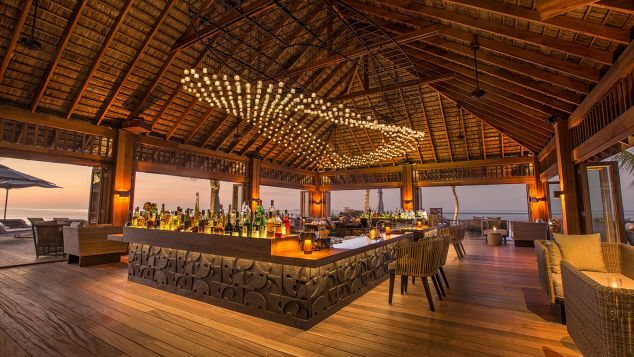 Bars include the Coco Bar, located on the beach and open 24 hours. Aquarium Bar is over-water and offers indoor and outdoor seating. 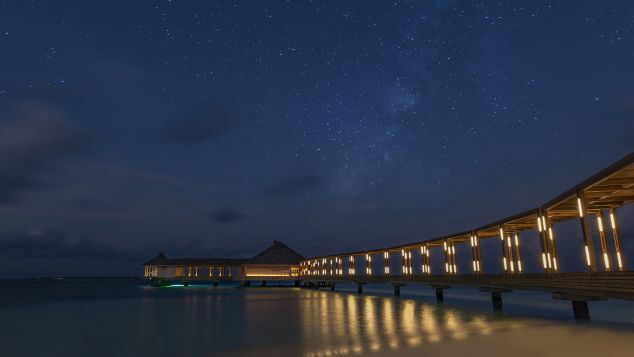 The small Champagne Pavilion, also over-water, sits at the end of the Ocean Villa jetty. It's the ultimate place for a sundowner. Bonus: Pods of dolphins regularly pass by. The dive center caters to beginner and experienced divers and can plan dives on either the resort's house reef or to some of the Lhaviyani Atoll's 50-some dive sites. Due to Hurawalhi's unique position in the atoll, the area attracts a huge array of marine life, such as manta rays, reef sharks and -- as we experienced first-hand with Bennett -- a group of massive sea turtles that regularly gathers to feed on sea grass. Pool villa interior: Ocean-facing villas feature direct access to the sea via a staircase. 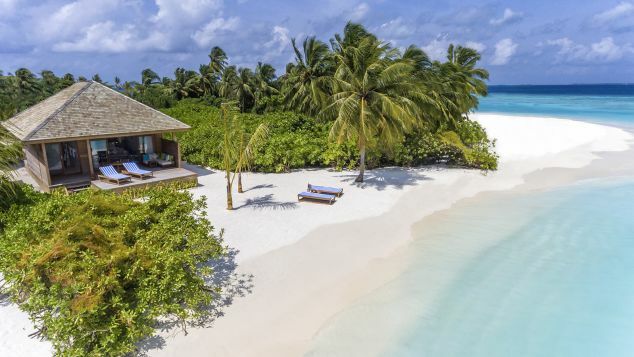 White sands, naturally: It wouldn't be a five-star Maldives resort if it didn't have stunning white-sand beaches. The resort offers guests a variety of land and sea activities. The pool: Villa doesn't have a pool? Not to worry, there's a communal one next to the Coco Bar. Reception: The resort offers a variety of dining and drinking packages, from half-board to all-inclusive. 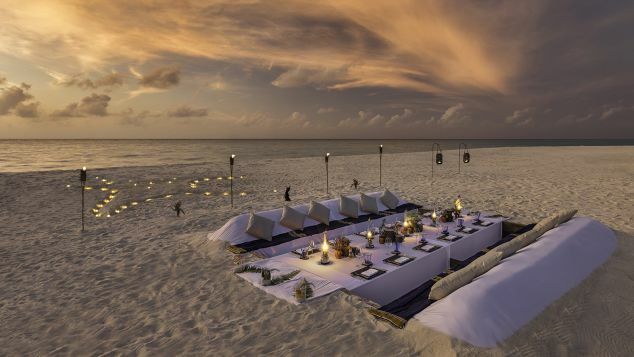 Dream Island Beach Dinner: Guests of Hurawalhi can arrange private dinners on the resort's offshore "Dream Island." Aquarium Restaurant: In addition to the 5.8 Undersea Restaurant, there's the over-water Aquarium Restaurant and the beach-side Canneli Restaurant. Solar panels: Hurawalhi's sustainability efforts include a series of high-efficiency solar panels that convert the sun's rays into electricity. For 11 hours a day, 2,735 panels help power the resort. 5.8 from above: Manufactured in New Zealand, the restaurant's glass is 15 centimeters thick and was shipped in one entire piece then lowered down with a special crane. 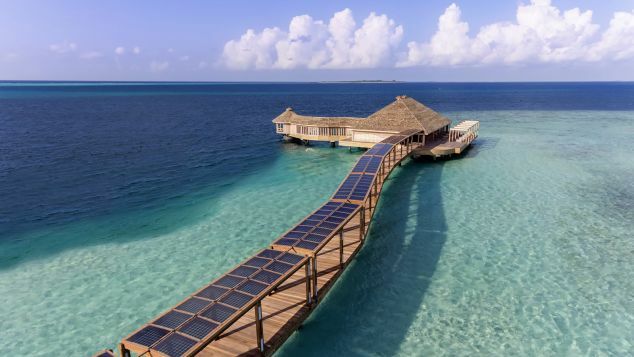 Beach villa: Over-water villas aren't for everyone. Prefer sand under your toes? 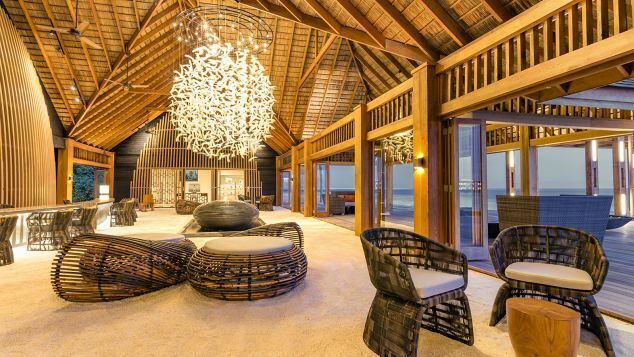 Hurawalhi has 30 beach villas. Coco Bar: Hurawalhi's Coco Bar, located on the beach, is open 24 hours and airs major sporting events on its big screen. 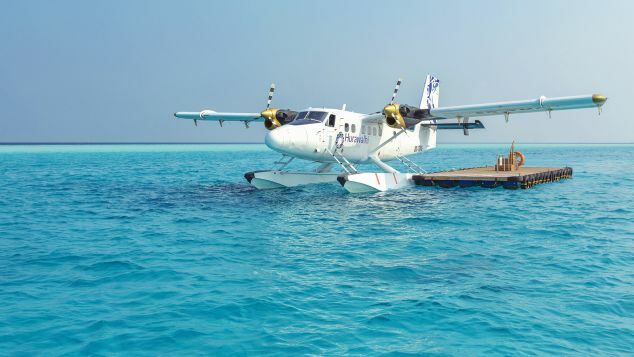 Getting in: Hurawalhi is just a 40-minute seaplane flight from Male International Airport. 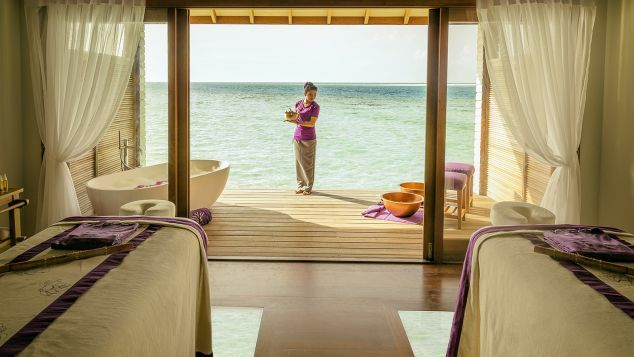 Duniye Spa: Hurawalhi's spa offers a wide variety of beauty and relaxation treatments.